A couple of years ago, I reviewed The trouble with management by this author, although it had been published a couple of years earlier. I reviewed it so late because I thought that it said things about management that were missing from the rather turgid volumes of the management gurus, and also because it was well written and had things to say about the character of management writing—not much of it complimentary! Today, however, I have the opportunity to review his latest work its year of publication. The theme is more specialised: he considers, this time, the nature of leadership and distills into seven chapters (preceded by an introduction and followed by an epilogue) some truths about leadership that often deviate from the rhetoric of what I think of as the 'Harvard Business School Macho Leadership Model': I had the experience of serving under a 'leader' who believed in that model and to say that relations between himself and many of those whom he wished to have follow him was strained would be putting it mildly. There is an important plural word in the sub-title of the book, which gives a clue to the way the author approaches ideas on leadership: that is, 'ways'. 'Finding your own ways to practice leadership'. The other important word, of course, is 'finding'. From the subtitle alone we can derive two important lessons about leadership: first, it is not one way of doing everything as a leader and manager; different problems, different settings, different teams or groups require different ways of handling them in demonstrating leadership; and secondly, leadership is something you find your way towards: you might learn something from the management gurus, you might learn something by attending leadership seminars, and you will certainly learn some useful things from this book. But, for all the learning, leadership is ultimately about acting and you have to find your own way in interpreting what you have learnt and applying it. I think we all know a couple of 'leaders' for whom that description fits! 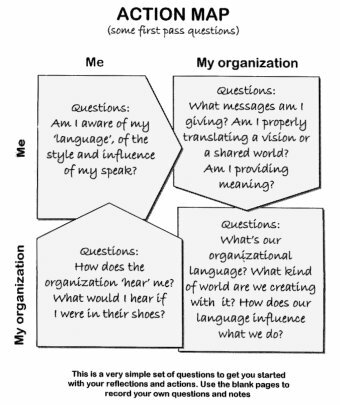 As you see, the 'action map' is a set of simple questions to get the reader (or the group) thinking about the key themes of the chapter. Dean, remember graduation day? You were on stage trying to drive the long procession of students at a pace to get our diplomas. We were both slow and overwhelmed. From the corner of the stage you kept telling us in your deep voice: Keep moving! Keep moving! You know, Dean? That was the best business advice given to me in all those three years. This is what I have been doing since. Buy this book, read it, enjoy it and learn from it. Everyone in an organization has to lead in one way or another - you won't be wasting your time, no matter how far away you are from the top spot - and if you want to get to the top spot there are organizational leadership degrees online as you can find out here.